Safer, improved bikeways are coming to Third Ward! 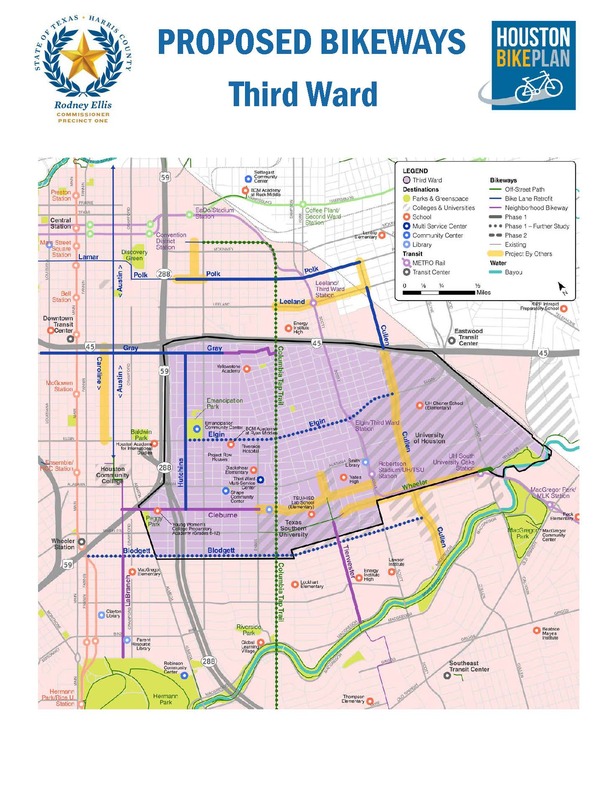 The Third Ward community has set mobility and infrastructure goals through several studies and plans, including the Third Ward Mobility Assessment report and most recently the Third Ward Action Plan under Mayor Turner’s Complete Communities initiative. One goal in particular – to expand bike lanes and facilities – is addressed directly through the proposed rapid implementation bikeway network. The City of Houston-Harris County partnership seeks to meet that goal which will ultimately improve neighborhood mobility and increase safety and comfort for all road users. The City of Houston Planning and Development Department has met with, and will continue to meet with, Third Ward community members to discuss the area’s bikeway network plans. Since the last community meeting, the project team has been diligently working behind the scenes to identify, explore and address potential physical challenges for each of the bikeway routes. Based on the findings, each route advances to the appropriate stage within the project’s process. Figure 1. shows the general process of the rapid bikeway implementation network (R.I.B.N) and below is an explanation of each phase. Public Engagement – City of Houston planners meet with the community to collaborate on bikeway plans including priority destinations and connections as well as preferred routes. Once priority routes are identified, the routes are reviewed for feasibility. If routes raise some initial concerns, they enter a Study phase for thorough inspection. Study – Traffic Engineers, Inc. (TEI), conduct more intensive feasibility analyses and traffic studies to determine if the selected routes are viable. If not, the route(s) may be removed from the priority list for the City-County rapid implementation bikeway network project (although the route can be considered for other future projects). However, if the study finds the route feasible, it will enter the Design phase. Design – Toole Design Group works to devise safe, functional bikeway designs that complement existing infrastructure. The design team works in collaboration with Houston Public Works and TEI to ensure that suggested designs are physically feasible and able to be implemented quickly. Once all designs are approved, the selected route will enter the final phase, Construction. Construction – Harris County Precinct 1 and Jones Carter secure the contractors and manages the construction process. City of Houston planners will engage the community before, during, and after construction. Following the identification of priority bikeway routes by the community, a feasibility analysis was conducted by the design consultants for this Precinct One project. Since rapid implementation is the goal of this project, feasibility of the selected bikeway routes depends on factors including existing pavement conditions, safety, and connectivity to a larger, bikeway network referred to as the regional spine. On the below map each route is labeled based on the feasibility analysis results. Phase 1 represents routes that passed a preliminary feasibility analysis. Phase 1 – Further Study are routes that are of high interest to the community but will need further research due to their complexity. Phase 2 are bikeway routes also identified by the community, but are not feasible to implement by April 2019, as they are long-term project. Project by Others, the yellow highlighted segment, indicates that there are plans to improve street and bike infrastructure in that area by an entity outside of the City of Houston. Click the below links to find the meeting notes for each of the listed meetings.